I'm trying to install the Android SDK on my Windows 7 x64 System. jdk-6u23-windows-x64.exe is installed, but the Android SDK setup refuses to proceed because it doesn't find the JDK installation. Is this a known issue? And is there a solution? Press Back when you get the notification and then Next. This time it will find the JDK. Do as it says, set JAVA_HOME in your environment variables, but in the path use forward slashes instead of backslashes. For me it failed when JAVA_HOME was C:\Program Files\Java\jdk1.6.0_31 but worked fine when it was C:/Program Files/Java/jdk1.6.0_31 - drove me nuts! I found the solution and it's beautifully stupid. I found Android SDK cannot detect JDK. Press the Back button on the SDK error screen that tells you that the EXE couldn't detect the JDK. Then press Next. I downloaded the .zip archive instead and ran SDK Manager.exe, and it worked like a charm. You had the same issue with the .exe otherwise. Warning: As a commenter mentioned, don't try this on a Windows 7! I tested it with Windows XP 64 bit. As the posted solution does NOT work for all (including me, myself, and I), I want to leave a note for those seeking for another way (without registry hacking, etc.) to solve this on a Windows 64 bit system. Just add PATH (capital letters!!) to your environment Variables and set the value to your JDK-Path. I added JDK to the existing "Path" which did not work, like it didn't with JAVA_HOME or the "Back"-Solution. Adding it to "PATH" finally did the trick. I hope this might be helpful for somebody. All you need are the following two registry entries. It appears as if whoever posted the other registry stuff basically just copied all the keys from HKEY_LOCAL_MACHINE\SOFTWARE\JavaSoft into HKEY_LOCAL_MACHINE\SOFTWARE\Wow6432Node\JavaSoft, which obviously isn't an ideal solution because most of the keys aren't needed. None of the solutions here worked for the 64-bit version. Putting the JDK path before the c:\windows\system32\ path in your environment variables solves the problem. Otherwise the 32-bit java.exe is found before the 64-bit JDK version. After reading a couple of blog posts, it does seem to be even an easier fix by clicking BACK when the installer says couldn't find the JDK, and then simply click NEXT again and magically it finds the JDK. No registry messing around or re-downloading etc.. Adding JAVA_HOME environment variable (under System Variables) did the trick for me. Clicking "Back" and "Next" buttons didn't work. I think that installer tries to find JDK in specific (1.6?) version and if it can't find it, checks JAVA_HOME which was not set in my case. I have another computer (the same system but with JDK 1.6 x64) and it worked without JAVA_HOME variable. I'm using 64 bit Windows 8. The guy above who put this: "I experienced this problem too, but none of the answers helped. What I did, I removed the last backslash from the JAVA_HOME variable and it started working. Also, remember not to include the bin folder in the path." This was in fact the correct answer. For this SDK to install this is what I did. I am running the latest Microsoft OS Windows 8. Path At this end of WindowsPowerShell\v1.0\ simply add ";C:\Program Files\Java\jdk1.7.0_09"
Press Report error and OK. Next will be enabled. Try downloading and installing the zipped version rather than the .exe installer. Also, RUN AS ADMINISTRATOR! Worked for me with backslash fix. I had the same problem and solved it by installing the x86 version of the JDK (on Windows XP x64). I had the same problem, tried all the solutions but nothing worked. The problem is with Windows 7 installed is 64 bit and all the software that you are installing should be 32 bit. Android SDK itself is 32 bit and it identifies only 32 bit JDK. So install following software. Eclipse (32 bit) and finally ADT. I tried it and all works fine. I experienced this problem too, but none of the answers helped. What I did, I removed the last backslash from the JAVA_HOME variable and it started working. Also, remember not to include the bin folder in the path. 1-Simply done the "JAVA_HOME" environment variable thing. 2-Right-Click on Android SDK and from compatibletiy Tab Select windows 7 and administrator. Simply put your java bin path in front of your PATH environment. And now the Android SDK installer is working. BTW, I'm running Win7 x64. Yeah install the 32 bit version of the Java SE SDK (or any of the combinations). That should help solve your problem. You will have to download the 32-bit SDK version because Win7 64-bit is not supported only Windows Server 2003 has a supported 64-bit version. During the download of Java SDK pick "Windows" as your platform and not "Windowsx64". Once I did this android SDK installed like a charm. Hope this helps. Still baffled by this problem; especially since beta versions of Android Studio worked just fine. The above methods did not work for me in Windows 8 Pro. Where C is your drive in which you have installed the JDK. Don't forget the backward slash at the end. JAVA_HOME defined using forward slashes (/) instead of backslashes (). JDK 'bin' directory listed at beginning of PATH. Not the answer you're looking for? Browse other questions tagged java android sdk windows-7-x64 jdk6 or ask your own question. 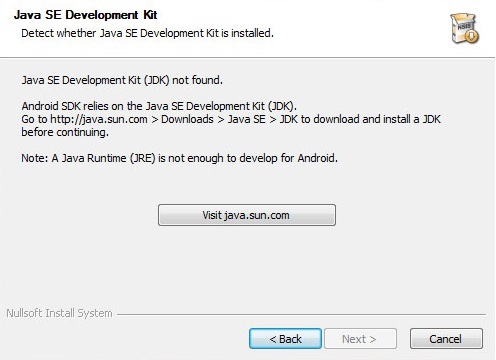 Installing Android SDK on Windows 7 64-bit: “JDK not found”?